A while ago (ETF17) I had a good chat with Jac from JacMusic and at that time he told me that his new EML45B actually was capable in putting more power out than the original 45 and still able to replace it. The distortion drops remarkably when using the EML45B at higher ratings and the things that had to be done were increasing the high voltage, change the cathode resisitor and in some cases the output transformer as well. We agreed on me doing an impression of the EML45B and he send over a pair. 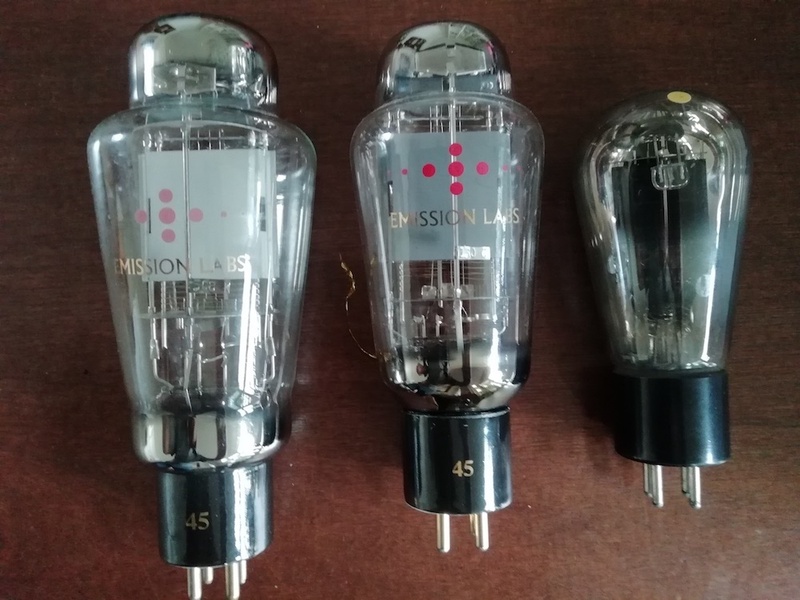 As it turned out I was quite busy with some other project(s) so I asked my good friend Rob if he would be interested in trying these as his amplifiers could be adjusted to the 45B needs fairly easy. This was recently done and he wrote this impression. At the end there is a technical postscript explaining a bit more on technical details. 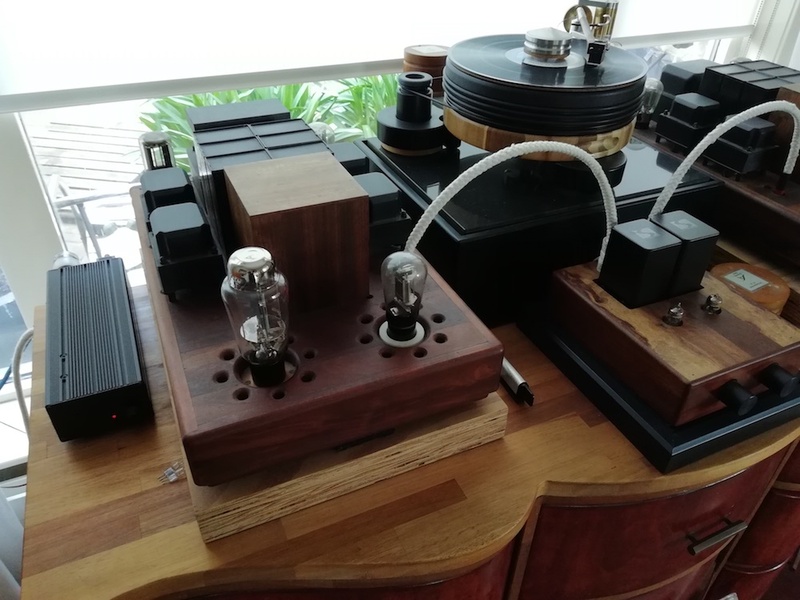 I once started with 2A3-tubes en PX25-tubes in my monoblocks. After a while I transferred to the 45. My audiofriend DHTRob recommended them to me. He built the amplifiers and suggested I try the 45. I chose the 45’s of Emission Lab (EML). That was an amazing experience. The 2A3’s were always nice to listen to, but the 45’s were in a different league. Especially when it comes to the mid-area. Voices are superior and the acoustic instruments just got a little bit more ‘real’. After the 2A3’s I started listening to the PX25 for a couple of years, especially because the music I listen needs a little depth in the low. I am talking about the acoustic jazz from labels such as Blue Note and Prestige. I also listen to 60’s souljazz and I need a little bit spirit in the low. After listening to the 45 from EML for a couple of years, I scored a set of the NOS 45 from Cunningham, a globe. For that reason, the EML’s got set on hold for a while. Unfortunately, the old ones don’t live forever and replaced them with a new set of EML 45’s. That was a surprise: a fresh sound and more spirit than the old 45’s. Certainly, they had to be replaced. But the interesting thing was that the timbre was very similar. Now the reason for this report. My taste in music has shifted to electronic jazz. I listen more to Portico Quartet, Kruder and Dorfmeister etc.. The bass in those recordings have become a challenge for my speakers, the PHY KM-30’s in the Grand Crescendo of Musical Affairs from late Hans Kortenbach. Experts know that those speakers have a cabinet that sort of effects the sound. The case is not rigid, but made from a few millimeters spruce. The choice for those speakers has always been a very conscious one for me. The timbre of the speakers is one for classical music and jazz with a small ensemble. 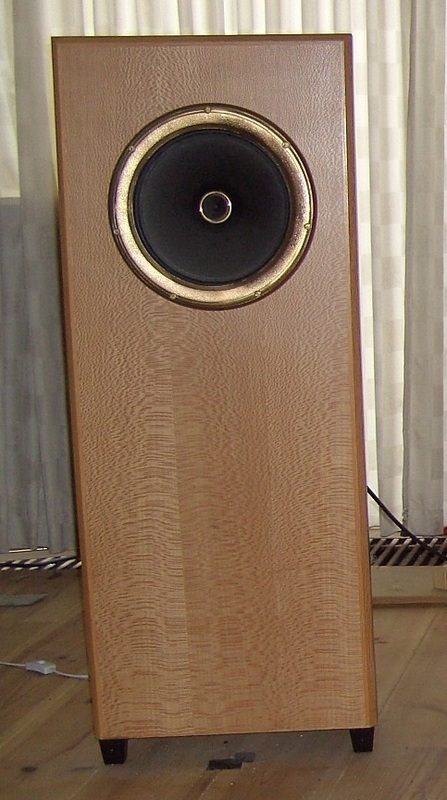 With the introduction of electronic jazz, I noticed that these speakers, with an efficiency of 97db, had a little bit of trouble. I always thought that this was due to the construction the Grand Crescendo’s. From left to tight: EML45 - EML45B (without the B-marking) - RCA UX245. After a while, DHTRob had something for me to try, as it usually goes. Jac van de Walle had sent him a set 45B tubes with the note that those need a higher voltage. This would result in the double amount of output power. From 1,5 to a powerful 3 watt. 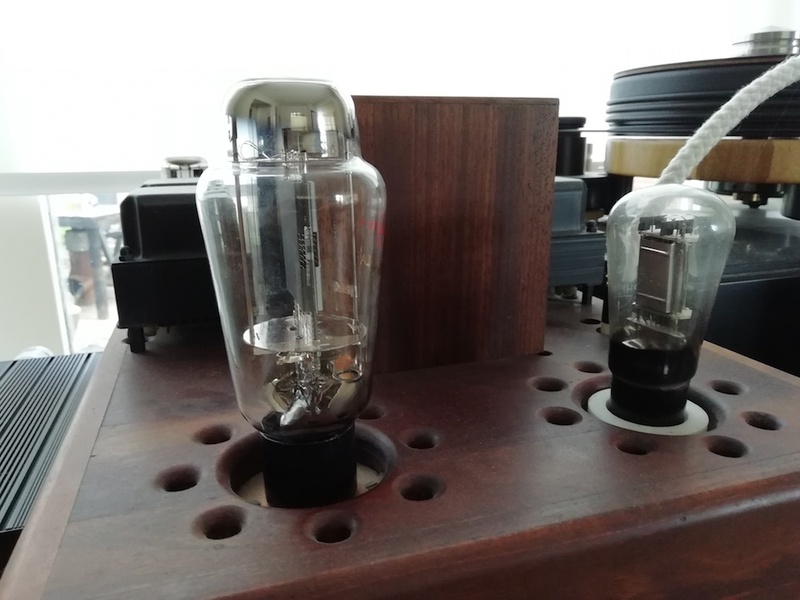 The request was to convert my amplifiers, so it would be possible to test the tubes. Especially because I have been listening to the 45, both EML and old ones, we agreed that I was the one to judge the differences between the three. But, why would I want to change the amplifiers I’ve built to my preferences? The result would be that I could play them on a higher voltage, but I wouldn’t be able to use the tubes I am currently using. A smart thing to do? Well, as the music afficionado I am, I can’t pass this opportunity. I am too curious. What would those extra watts give me with speakers with an efficiency of 97db? A few weeks ago, armed with a soldering iron and the required resistors, DHTob drove from his place to my place and a half hour later the amplifiers were ready to deliver the right amount of voltages to the 45B. Powering up a component is always a thrilling moment when you have been moderating it yourself. Will it work? Well, I can tell you that it works! And how! Everything that made me anxious beforehand did not happen. The first concern I had was if there would be still the same control in setting the volume with the TVC's on my amplifier. After all, with every step, more power could be added than before. Luckily, this wasn’t an issue. The amount of extra power does not interfere with regulating the volume. The second issue that concerned me, was that I was afraid I would get a 45 on steroids. Would I lose the beautiful sound the 45 is famous for? It turned out it was not an issue as well. The 45B sounds as at least as good as the 45. Better actually. The old 245’s are warmer in the mid-area and high-area than the 45 by EML. When compared directly, the new 45 from EML are not as involving as the old 245. On the other hand, the 45’s from EML are better at presenting details. It is a matter of personal preference. Do you want that detail and spirit or a calmer and smoother sound from the old tubes? The new 45B however, combines the best of both tubes. The timbre is very pleasant. You could say the sound feels relaxed, but no information gets lost. Cymbals, very prominent in 60’s jazz, sound clean, very clean. With the old 245’s they sounded smooth, not very detailed. With the regular 45’s they were kind of grained. With the 45B, they sound amazing. The mid-area, the area they are designed for, sounds perfect. Vocals sound beautiful textured are placed realistically. The stage seems to have increased in size. I think this is because of the increase in power. Then the low-end response. I expected big changes from the 45B’s, and they delivered. They control the low-end very well. The messy lows, which I blamed on the Crescendo’s, has completely cleared up. Listening to small jazz ensembles was never really an issue, but now this gained an extra dimension. Ray Browns' bass is easier to follow and the contours of his original bass are clearer. Also, the low-end response of formations that play with an electric base has improved as well. Nicely defined and fully under control. EML45B at work being served by a choke loaded Ca driver. The set in which the EML45B was auditioned (see below). If you play with a high efficiency speaker, maybe >107db horns exempted, it could definitely be interesting to try the 45B from Emission Labs. I don’t know if you are also lucky enough to have a friend who is able to convert your amplifier, but maybe you can do it yourself or is your dealer able to. Soundwise you have nothing to lose. Moreover, the 45B combines the beauty of the old sound and the power of a modern tube. The high voltage was increased to 420 Volts and the cathode resistor to 1K8. This resulted in about 43 mA over the EML45B at a plate dissipation of almost 15 Watts which is almost twice the maximum for a standard 45. The output transformer remained unchanged and is an oversized 5K type by AE-Europe. In this case the plate current increased by 15pct, and that should be no problem with most output transformers. If the output transformer is restricted to the 36mA average for a classic 45, there is also a possibility to increase high voltage and adjust the bias in such a way, that the current will remain the same. Another thing is that playing the 45B at these higher voltages will also mean that more driving voltage will be needed to get the extra output power (appr 35 VRMS extra). However the effects will also be noticeable when playing music at the same level as before (read the review above: more power was not needed, it was the extra control of the speaker that made the difference). More about the set: The preamplifier is a transformer coupled 6AK5 in triode with a TVC inside. Recordplayer is a modified Nottingham Analogue with Schroeder-clone tonearm and DL103R in a wooden body. RIAA-correction amplifier is the E80F/5687 transformer coupled Trafomatic design on this site.